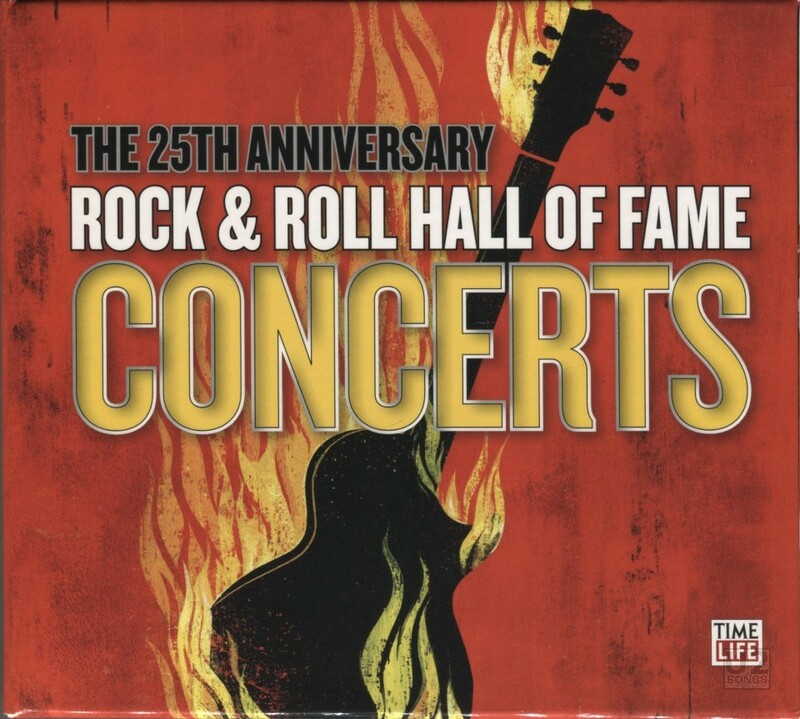 On October 29th and 30th of 2009, two nights of musical performances were held at New York City at Madison Square Garden to celebrate the 25th anniversary of the Rock & Roll Hall of Fame. The concerts presented artists from all walks of music, and focused on pairing artists up for performances. Fresh off the second leg of the U2360° Tour, U2 performed on October 30th 2009. During their performance, they were joined by Bruce Springsteen on “I Still Haven’t Found”, Bruce Springsteen and Patti Smith on “Because the Night”, the Black Eyed Peas on “Where is the Love / One”, Mick Jagger, Fergie and will.i.am on “Gimme Shelter” and Mick Jagger for “Stuck in a Moment”. The entire performance was shown on HBO. On September 28, 2010, the performances were issued in video format on DVD and Blu Ray formats by Time Life. The audio release would follow on November 2, 2010 with a set of CDs that was produced in the US, but sold in other countries. Two different formats were available for sale. The first was a four CD set which featured music from both nights of the performances. The other format was the same music as the four disc set, but it was sold in two 2-disc sets, one for each performance night. The four CD comes in cardboard packaging including an outer box to hold the fold out interior. The two-CD sets both came in jewel boxes which hold two discs in one regular sized jewel. The entire U2 performance is included here, and takes up a disc by itself in the set. It’s a mini-U2 live album, with lots of special guests. “Mysterious Ways” and “Where is the Love / One” which were only available as bonus tracks on the video release, are back in the place in the set list where they belong. As the set does not fade out at the start and end of the songs, it is a slightly different version of the audio from what is used in the video releases. On the CD the performance is complete, and goes directly into “Mysterious Ways”, and then directly into “Where is the Love” after “Mysterious Ways”. U2’s performance was recorded by long time U2 associates Carl Glanville and Jay Vicari. Performed by U2. Written by A. Clayton, D. Evans, P. Hewson, L. Mullen. Performed by U2. Written by A. Clayton, D. Evans, P. Hewson, L. Mullen, D. Lanois, B. Eno. Performed by U2 with Bruce Springsteen, Patti Smith and Roy Bittan. Written by B. Springsteen, P. Smith. Performed by U2 with Bruce Springsteen. Written by A. Clayton, D. Evans, P. Hewson, L. Mullen. Performed by U2 with The Black Eyed Peas. Written by W. Adams, L. Board, M. Fratantuno, J. Gomez, G. Pajon, A. Pineda. J. Timberlake. Written by A. Clayton, D. Evans, P. Hewson, L. Mullen. Performed by U2 with Mick Jagger, Fergie, and will.i.am. Written by M. Jagger, K. Richards. Performed by U2 with Mick Jagger. Written by A. Clayton, D. Evans, P. Hewson, L. Mullen.